(Wenham MA) It’s not over ‘til it’s over. 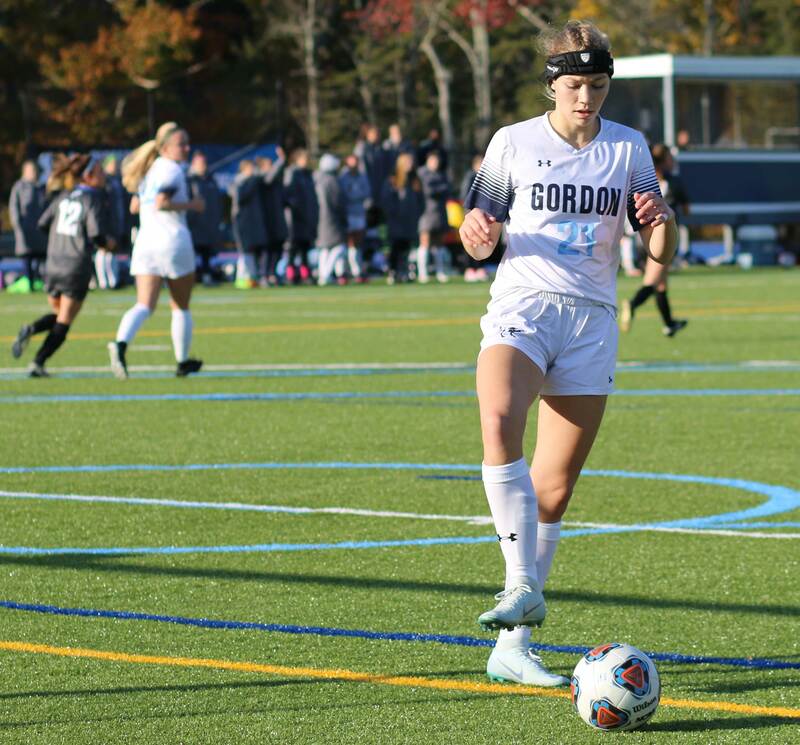 The clock was winding down on a scoreless game and the Gordon announcer was counting down the seconds………and UNE’s Katie Beaudoin was full speeding down the left side. 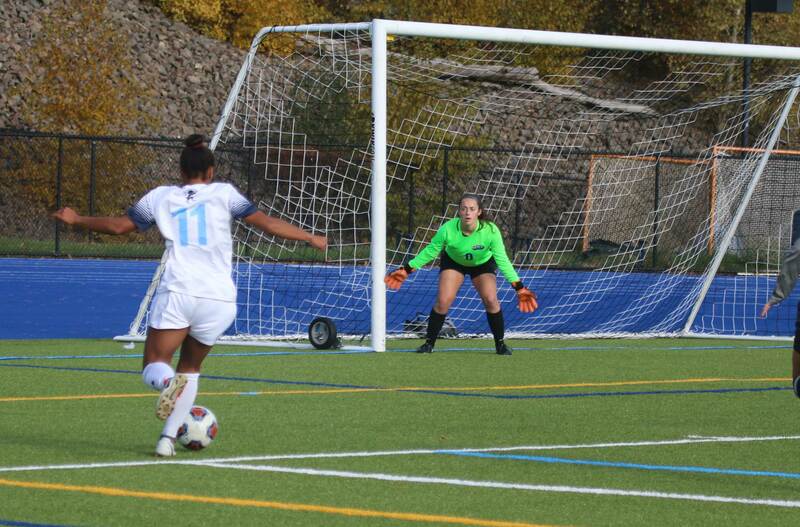 And shoot she did and off the hand of GC goalie Giselle Maso the shot went and into the far corner. There were only 2.7 seconds left in the game! Katie Beaudoin (4) under the scoreboard that shows the time but not the goal she just scored. 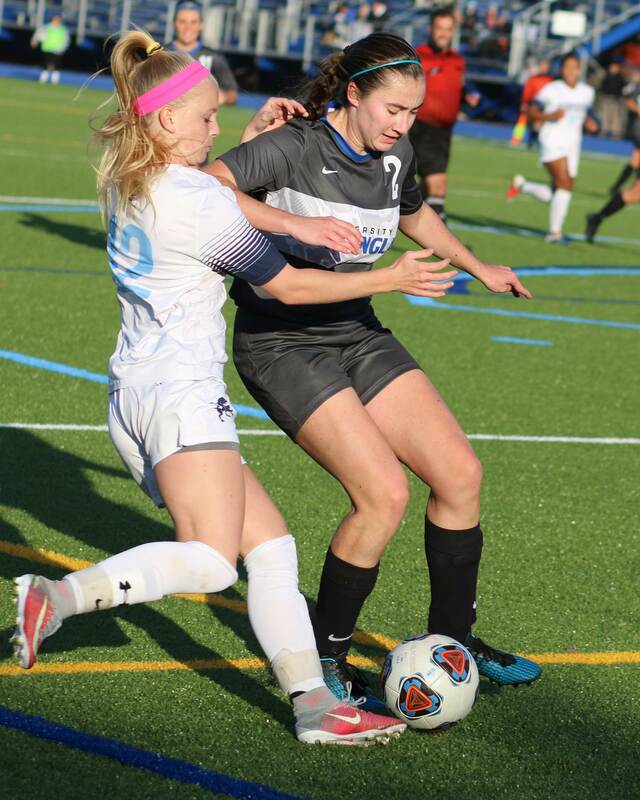 “She (Katie Beaudoin) is one of the top players in the conference and she came through for them,” said Gordon coach Chuck Breton. 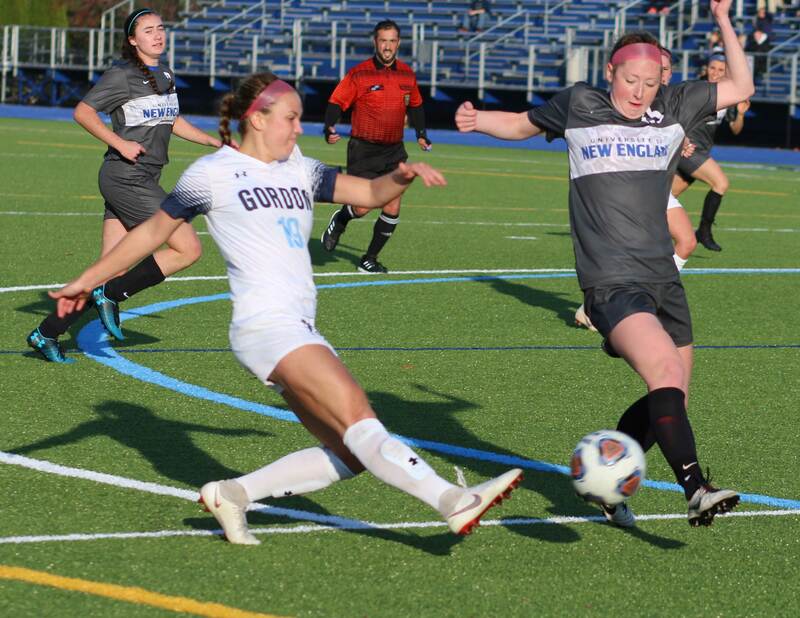 The win puts the Nor’Easters into the Commonwealth Coast Conference finals on Saturday. Definitely a game they are not all that familiar with. The last time? Eighteen years ago. I expected that Gordon would find a way to win this game because they, on the other hand, had been to the championship game five of the last six years. 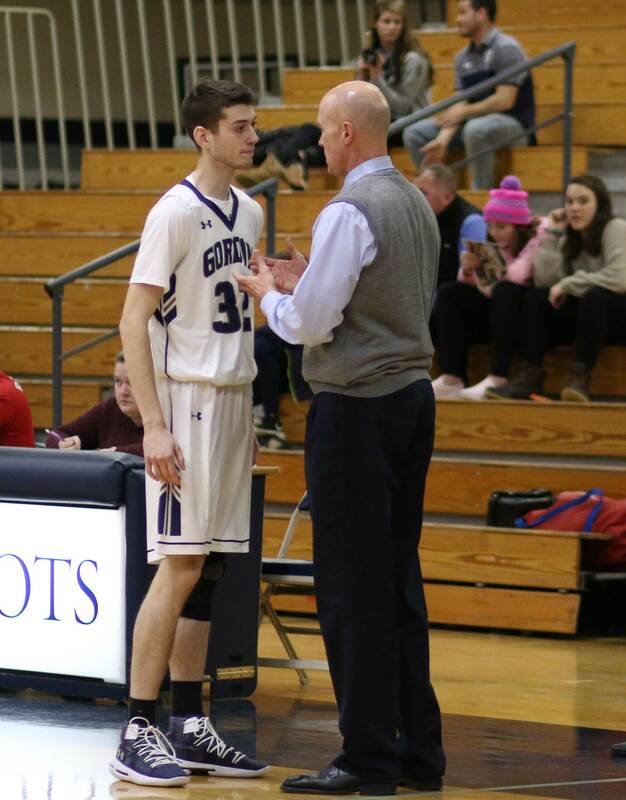 And furthermore, the Scots had won eight of their last meetings with the team from Biddeford (ME). But that’s why you show up. You don’t know how things will end up. Today’s game certainly had a shocking ending. 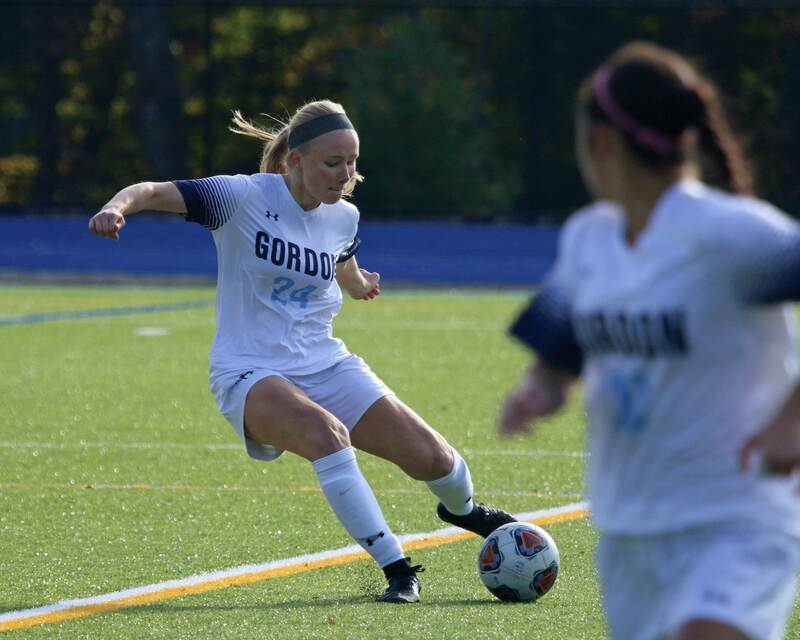 “The previous coach told me that we (UNE) had struggled with Gordon in the past,” said UNE coach Carly Gettler. But overtime never came and there was plenty of excitement among the visitors at the end of the game. And why not? 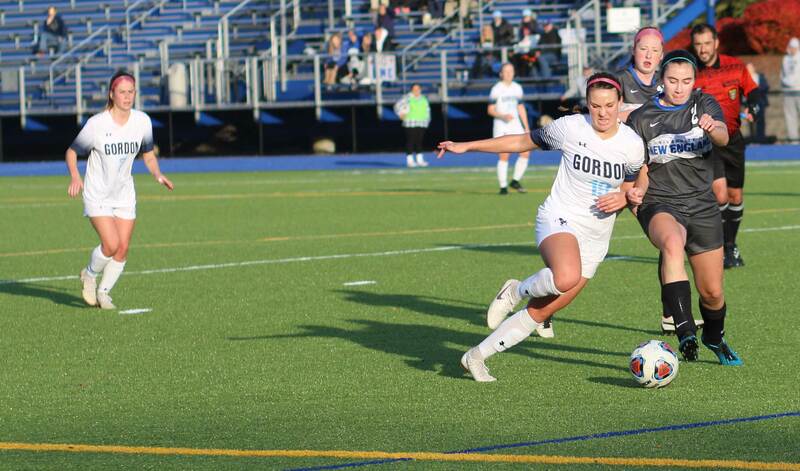 The Scots have the two top scorers (Lexi Potter & Asha Steele) in the league. 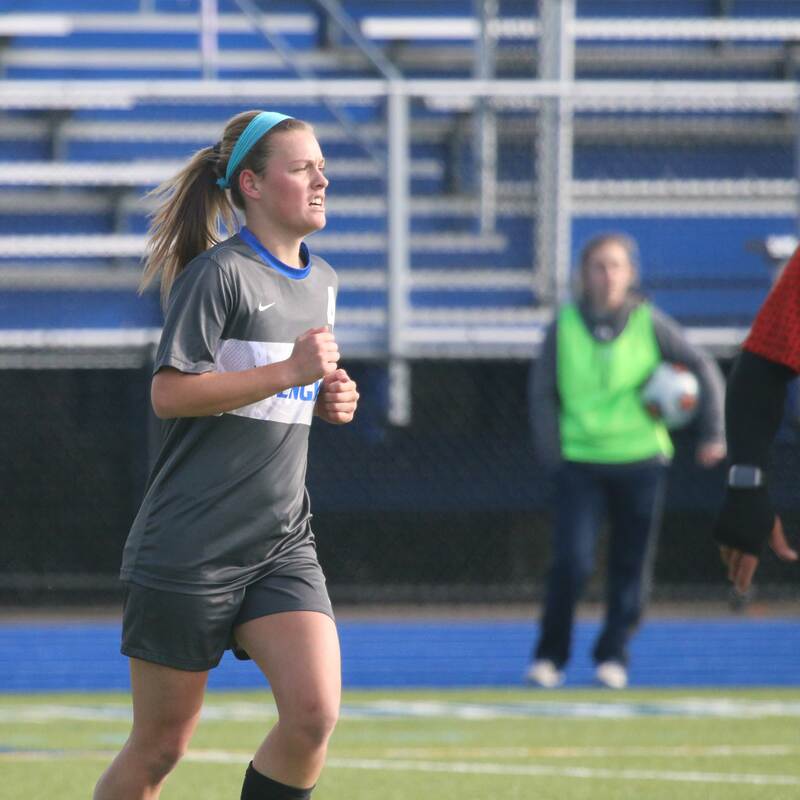 Lexi was named the Offensive Player of the Year because of her seventeen goals and six assists. 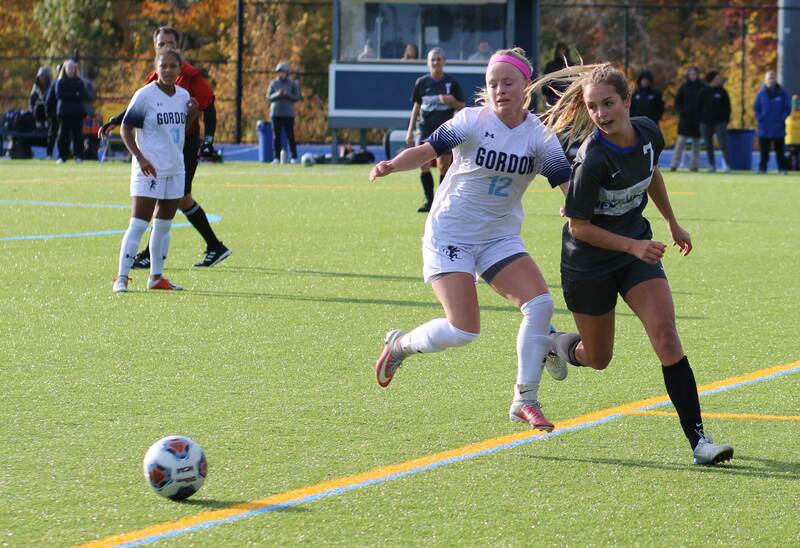 Gordon wanted to shoot early and often as they had in the previous 1-0 win over UNE in September. 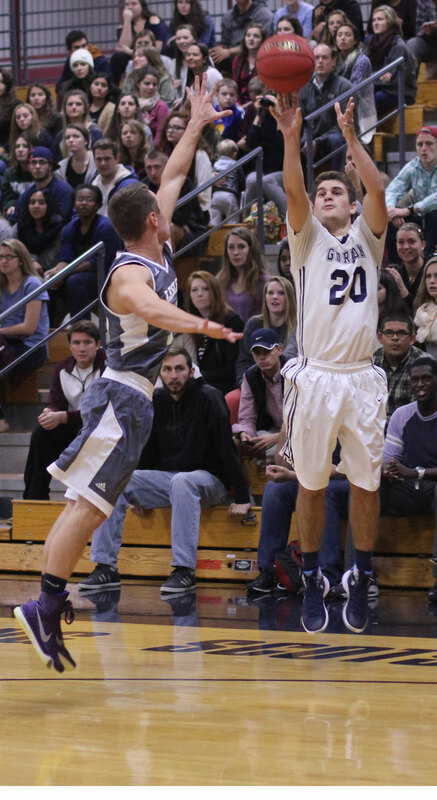 The Scots had 20 shots on that day and UNE just 8. This time the shots were almost even. 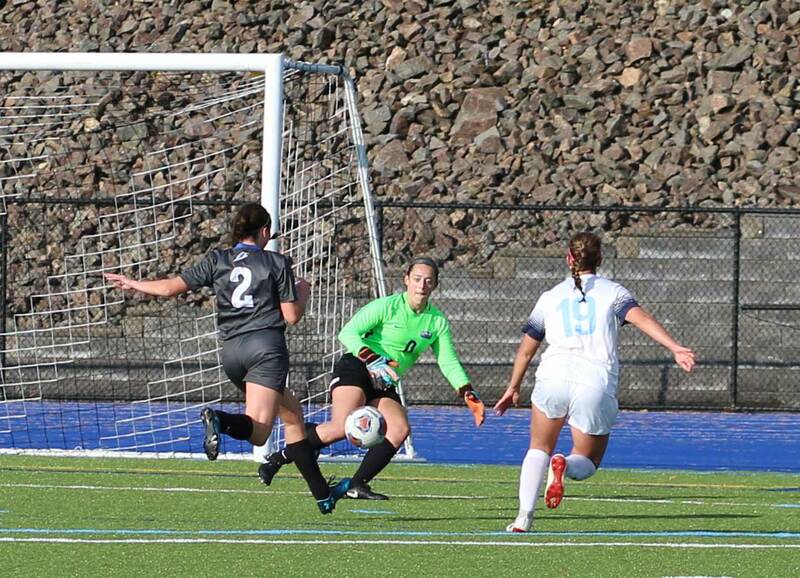 Goal keeper Jenna Pannone was challenged several times but not too seriously. 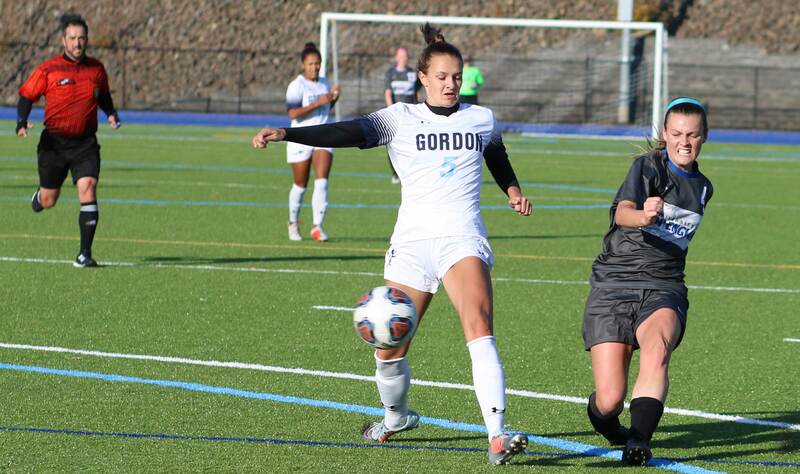 Gordon had several corner kicks but only a header on one of them by Monet Marshall was a serious threat. 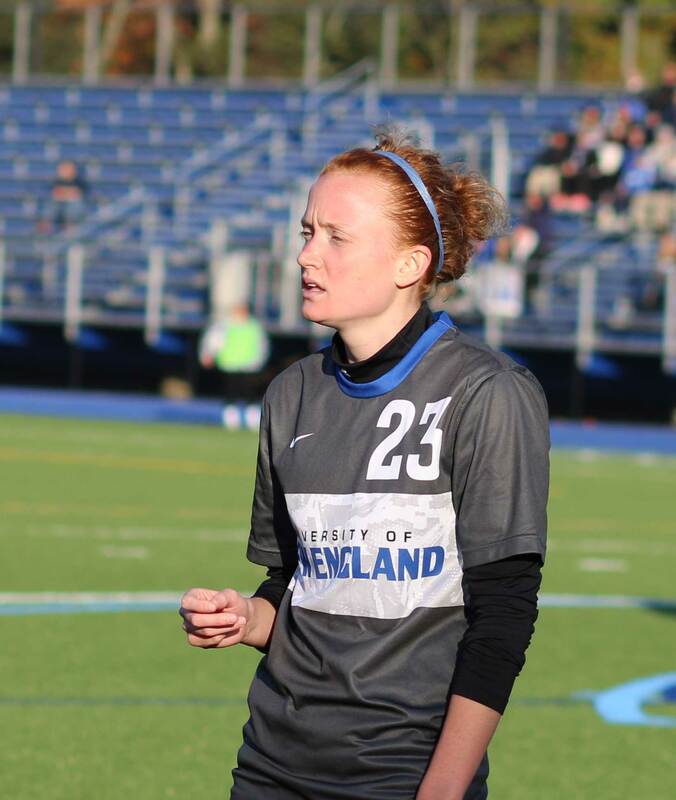 UNE (9-72) gets to play another game. Gordon (11-7-1) will have to wait until next year for another title attempt. Last title? Twenty years ago. This was my first time doing/seeing a game at the Brigham Athletic Complex. Impressive field. Plenty of seating. Decent parking. Excellent weather (low 50’s) for late October. 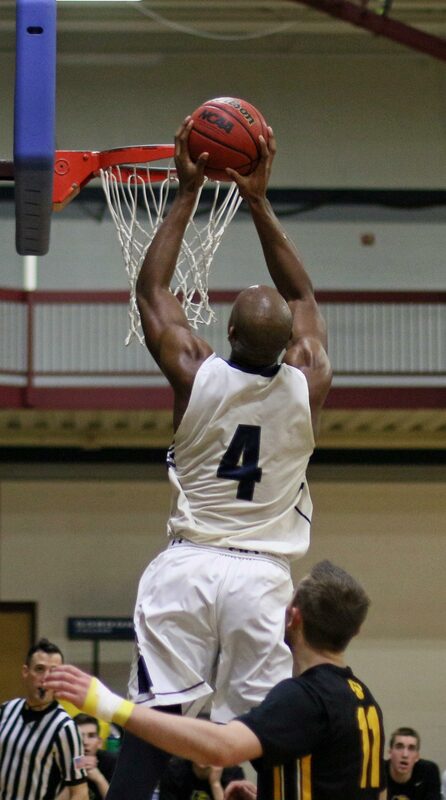 (Wenham MA) If you try to cover a game with the University of New England you better have career stats handy. 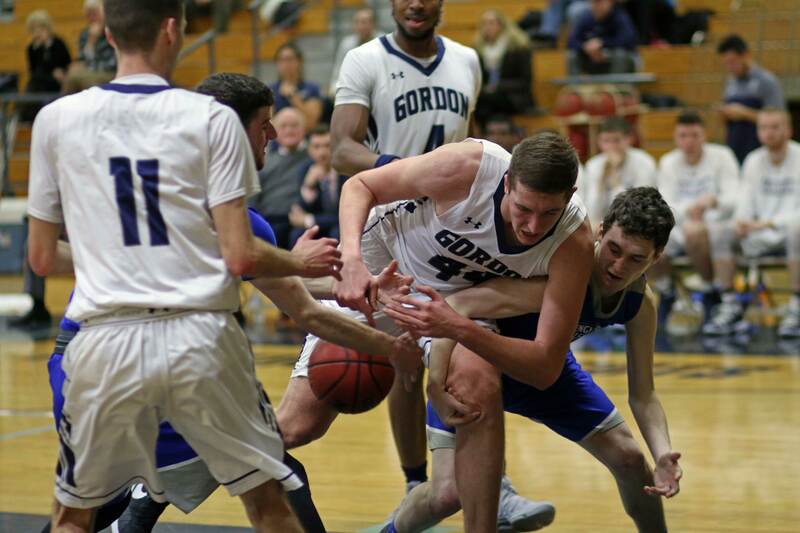 The Nor’Easters did all that, but it wasn’t enough as Gordon defeated them, 126-108, on Wednesday night in Commonwealth Coast Conference action. 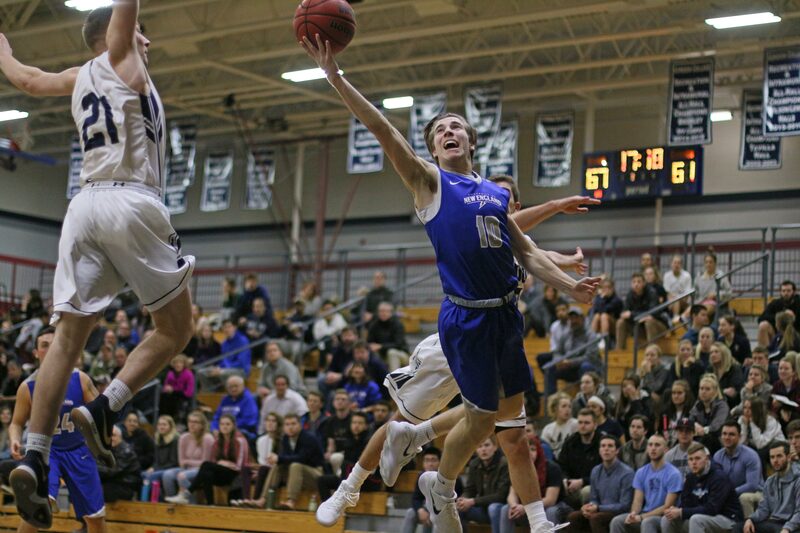 The Scots (12-6) had been on the wrong side of a 121-113 score at UNE earlier in the season and were better prepared this time around for what UNE would do. The Scots wasted little time getting the ball down the court. This was anyone’s game, considering how fast points were being scored, 7 ½ minutes into the second half. 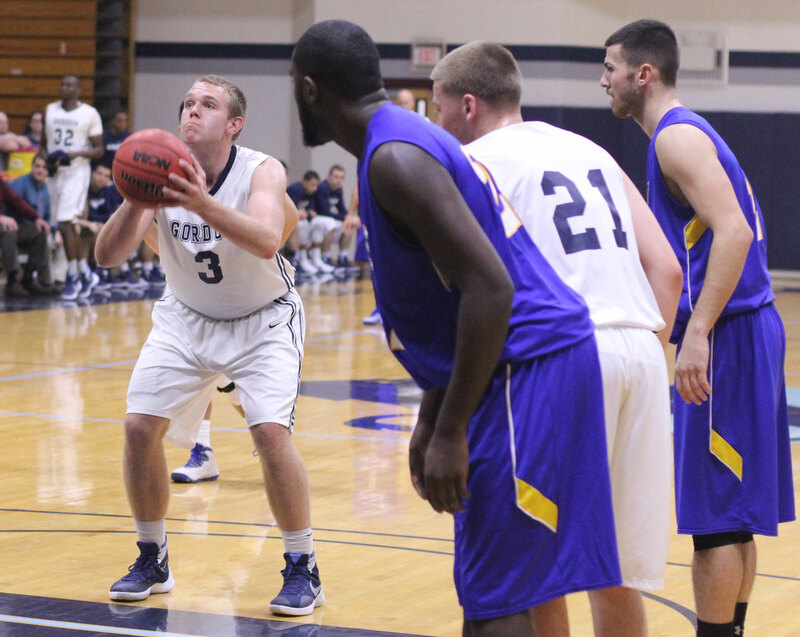 The Scots were in front, 84-79, but it was far from a comfortable lead. Five + minutes later, things were a whole lot different. 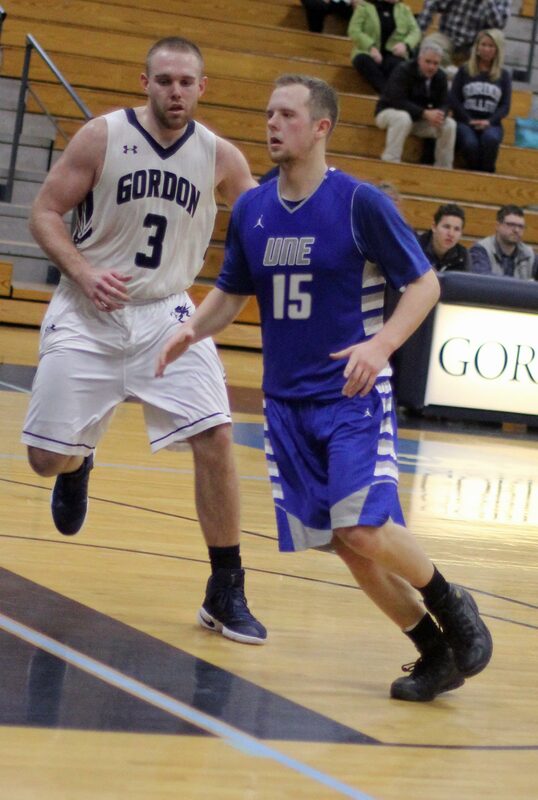 During that time, UNE missed all eleven shots from the floor, while the Scots went off with twenty-four points. 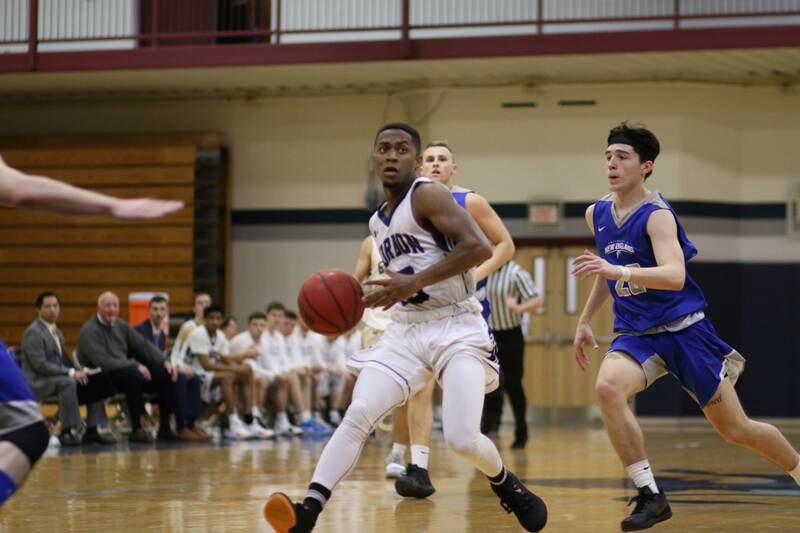 The beauty of those breakaway twenty-four points was that seven different players (Eric Demers, Jaren Yang, Josh Crutchfield, Avelino Damoura, Matt Valles, Josh Ribeiro, and Jake Haar) contributed. 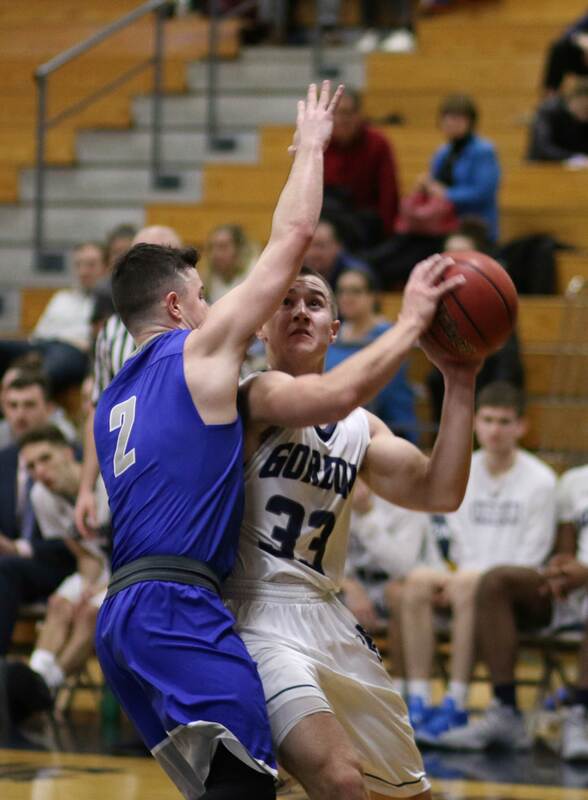 That sparkling display of scoring separated GC from the team from Biddeford, 108-81, with seven minutes to go. 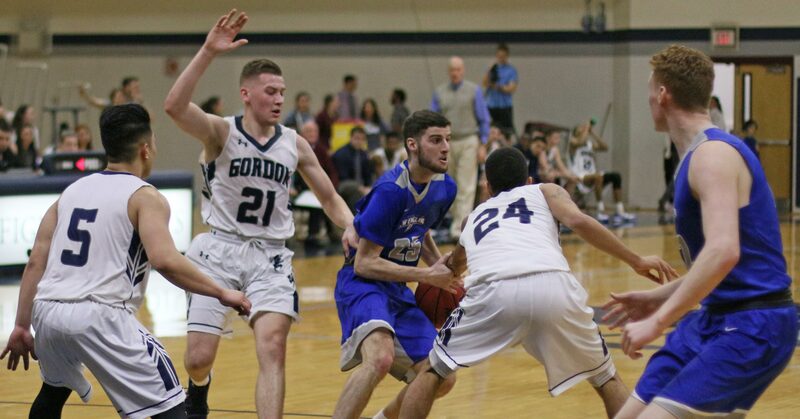 Still time enough for UNE’s instant offense and turnover-causing pressure to usher them back into the game but on this evening the Scots turned the UNE pressure into open looks (and points) the rest of the way and took the victory. 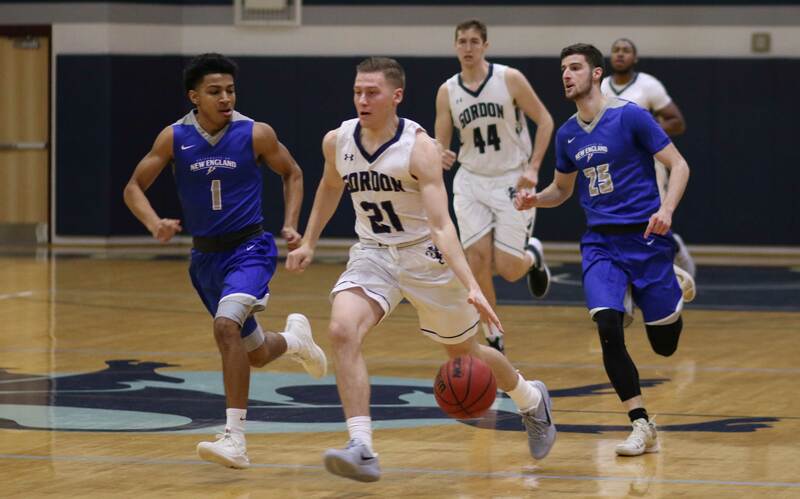 I have a hunch that several Gordon single-game records were broken in tonight’s win: most points (126), most assists (30), most blocks (11), and most made 3-point shots (18). 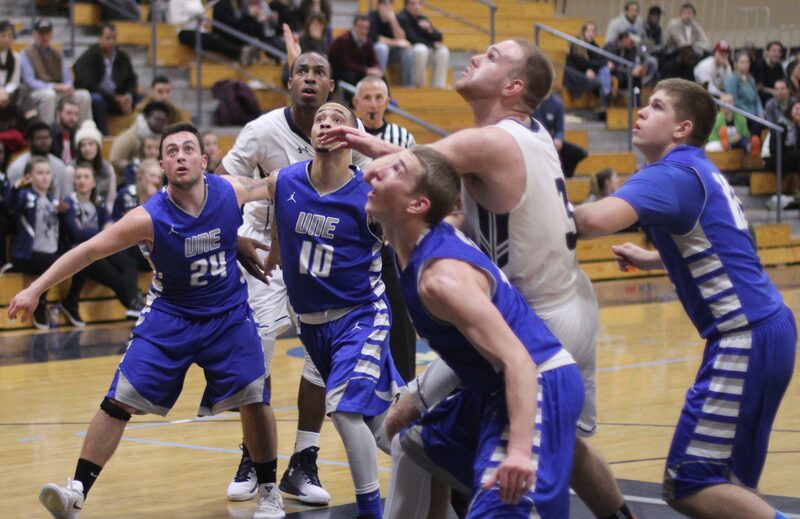 Quietly, among all the long-range shooting, Garrisson Duvivier had yet another double/double. 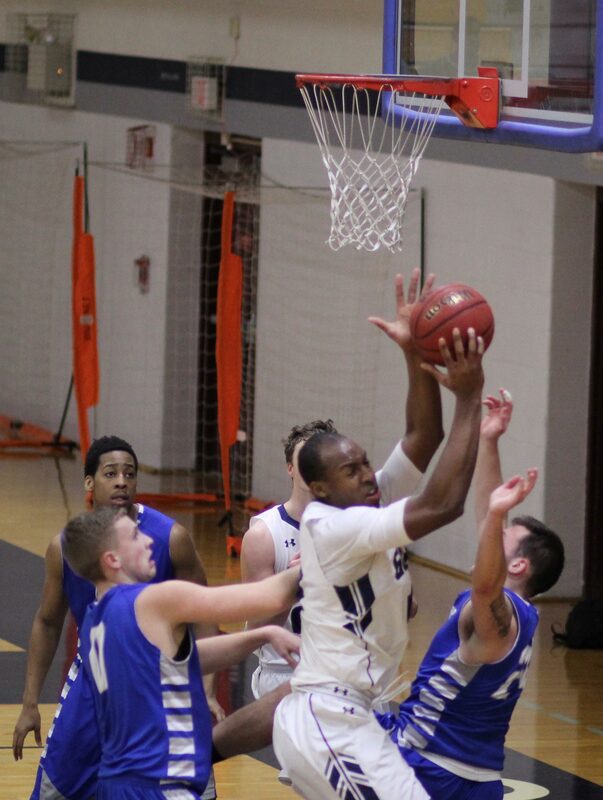 The talented junior put 18 points together with 15 rebounds. Garrisson now has seven straight games with Double D’s and thirteen for the season. After a look at the scoresheet I found additional good news: the GC freshman had a remarkable night. 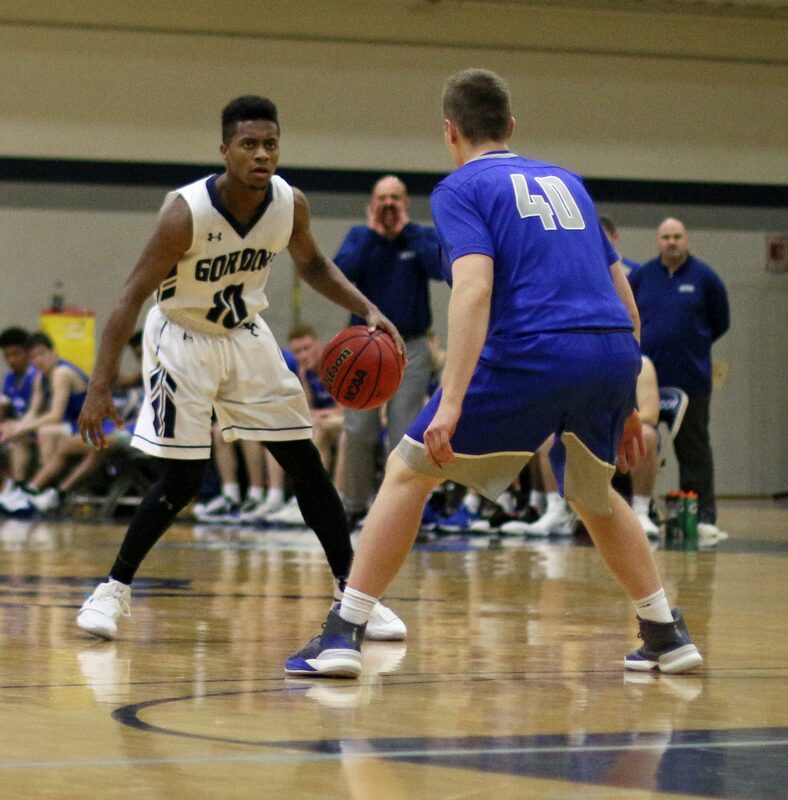 Career highs for the Class of 2020: Matt Valles 9 rebounds, Parker Omslaer 10 points, Josh Crutchfield 8 assists, and Avelino Damoura 9 points. Missing from the game was Noah Szilagyi. Noah has been hospitalized with pneumonia. “I was a little nervous going into the game without Noah because he spreads the floor for us,” said Eric of his teammate. I mentioned after the last game (Curry) how important the following four home games were. Three of the teams had beaten GC the first time around. UNE was one of those. Next opponent will be Nichols on Saturday (3PM). 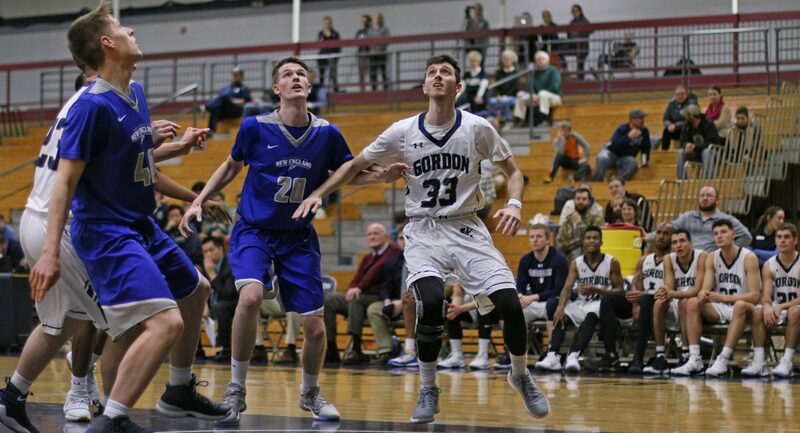 The top-seeded Bison shot over 50% against Gordon last time and collected 100 points and won convincingly in Dudley. Nichols is 9-2 in the CCC. The Scots are 8-3. A battle for the top spot will play out on Saturday afternoon. 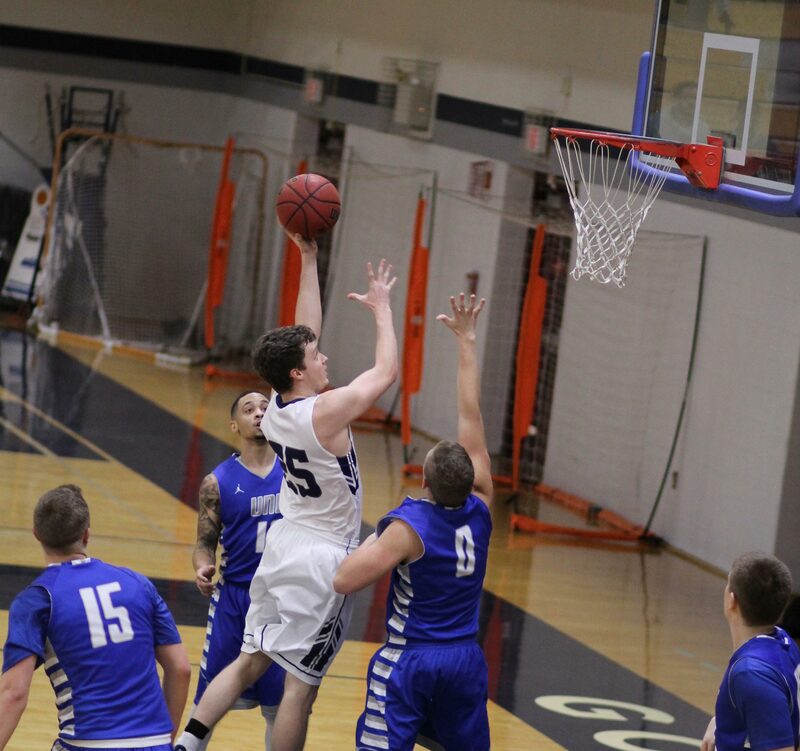 I saw, via the excellent UNE web broadcast, the Nor’Easters defeat Endicott and Nichols in Biddeford this past week. 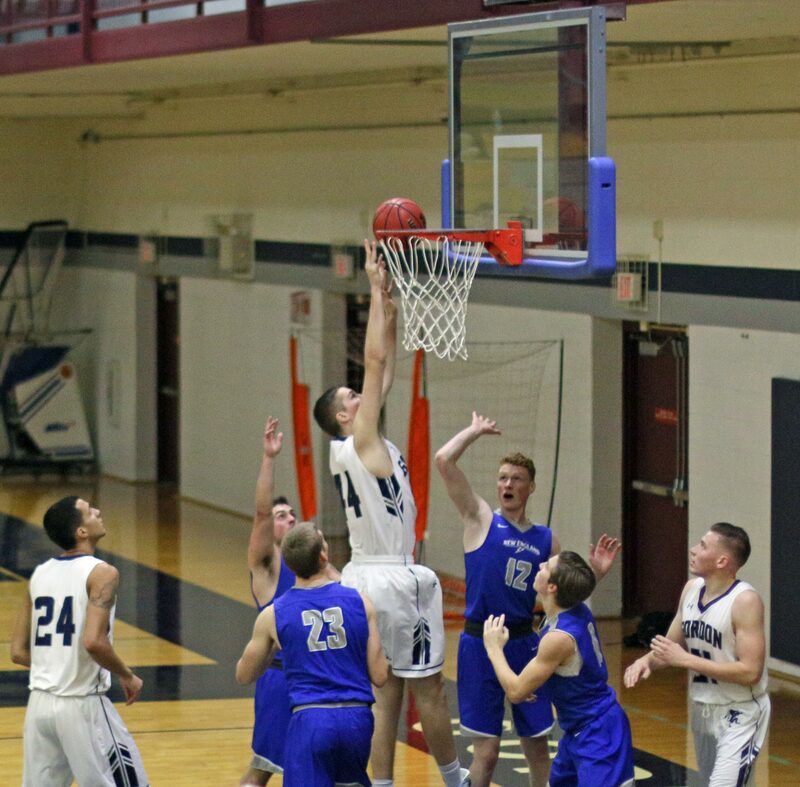 UNE (9-9) is now 2-6 on the road. 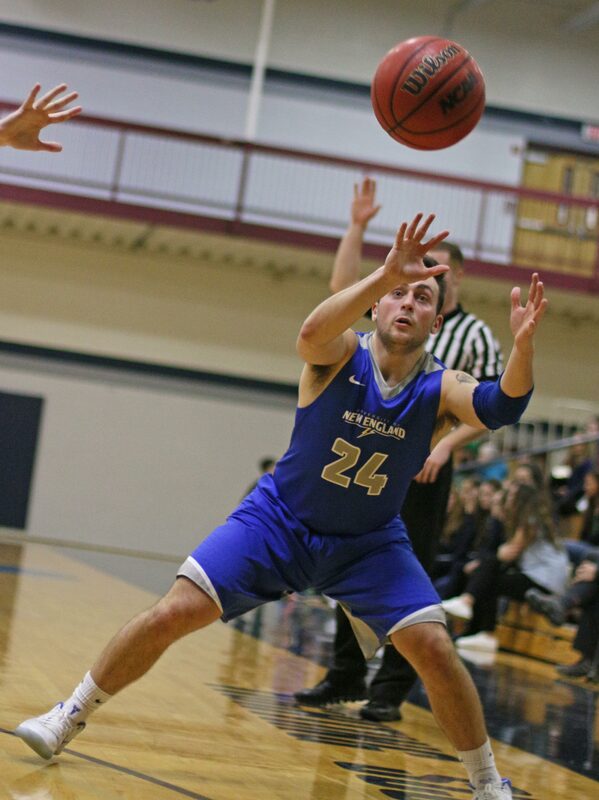 Wentworth is tied for second in the CCC. Tonight Curry almost got them in overtime. Despite multi-coverage, Garrisson Duvivier had a huge night for Gordon. 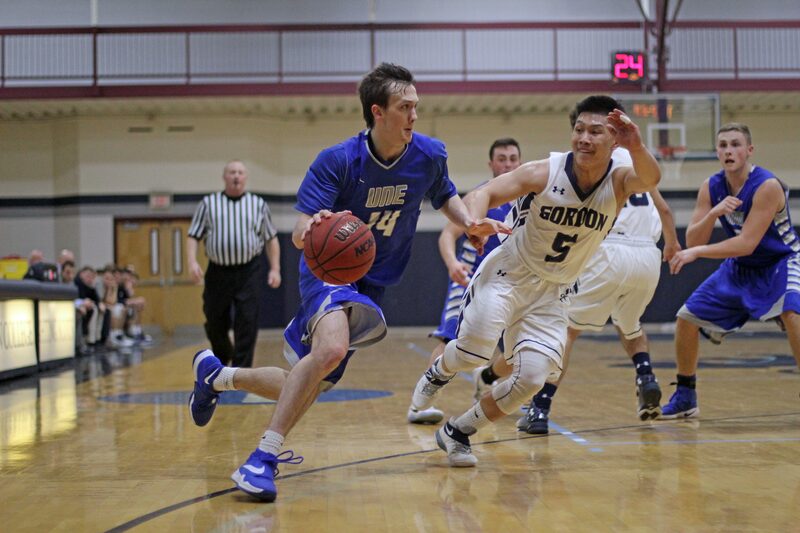 (Wenham MA) Last regular-season home game and it ended the way we hoped with a Gordon win. 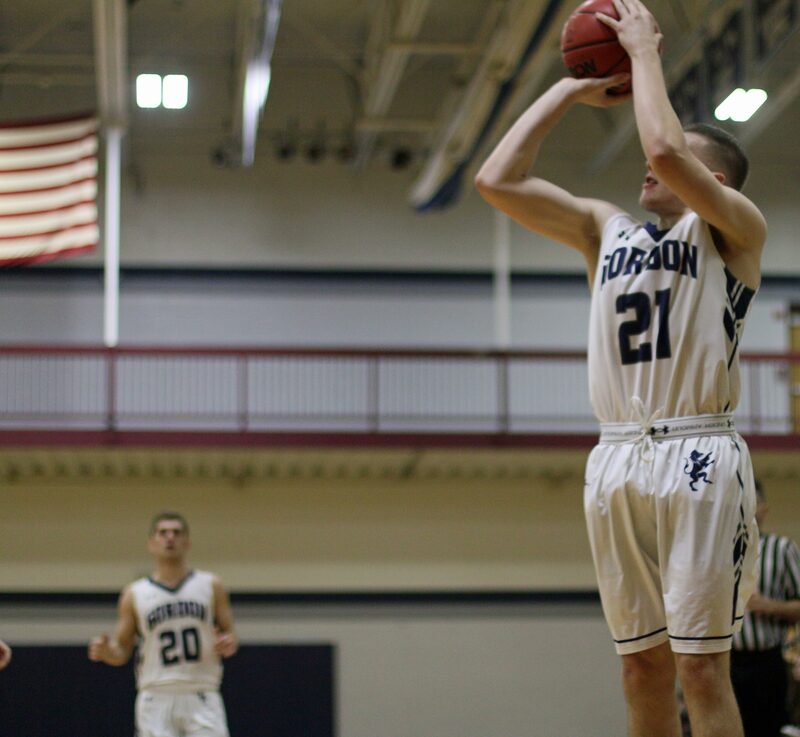 The Scots (14-10) held off a late rush by the UNE Nor’Easters (7-17) to earn an 80-72 victory on Tuesday night at the Bennett Center. 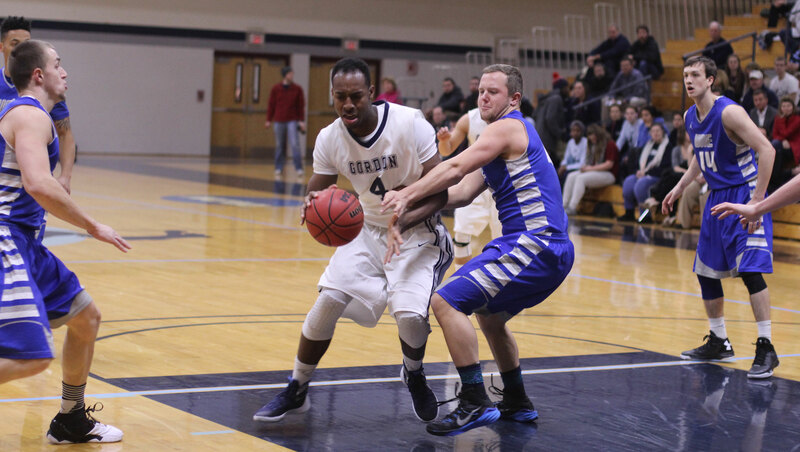 Garrisson Duvivier had his best game of the season for GC. 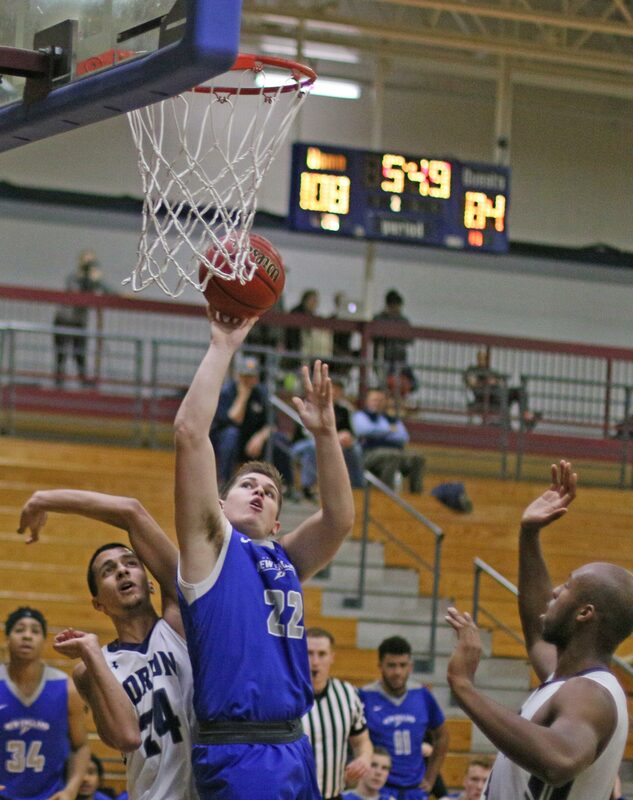 The 6-6 sophomore had his 9th double/double (22 points,11 rebounds) but also added 6 assists, 4 blocks, and 2 steals. 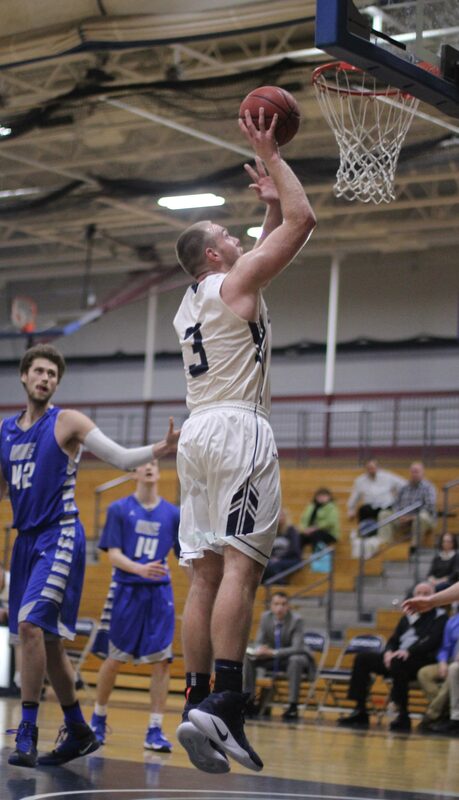 The visitors from Biddeford (ME) had a nice start but later in the half dropped behind by seventeen points (39-22). I thought then the game might get too far away from UNE for them to provide much of a challenge later. I was wrong. The Nor’Easters closed the half with a 10-1 run. They would not be going away. The longer the game went the closer the score seemed to get. 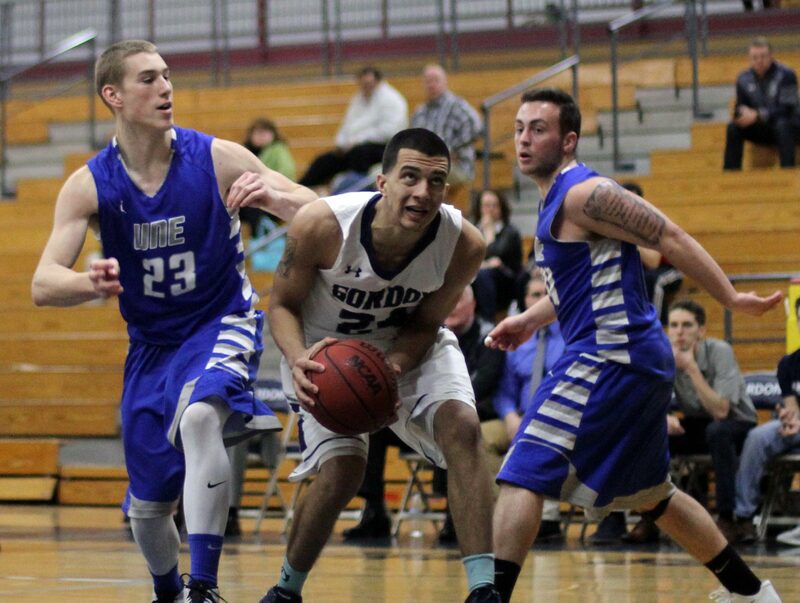 UNE was within six (52-46), then four (57-53), then three (66-63), and then two (72-70) with 2:29 remaining. Note the alarming pattern! However, on the next possession things turned for Gordon. 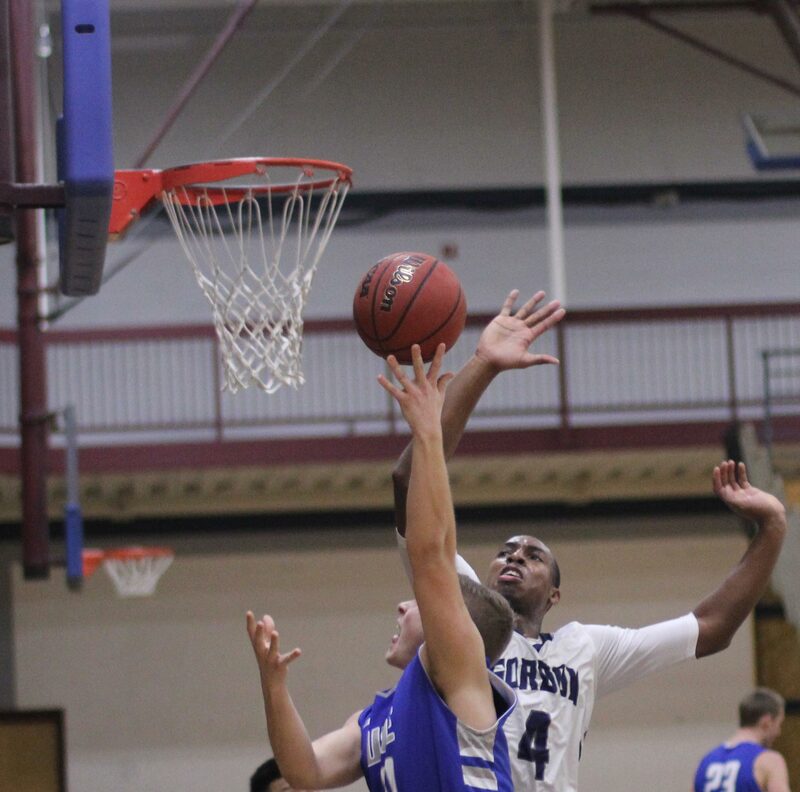 A missed shot led to an offensive rebound which became a layup for Garrisson. 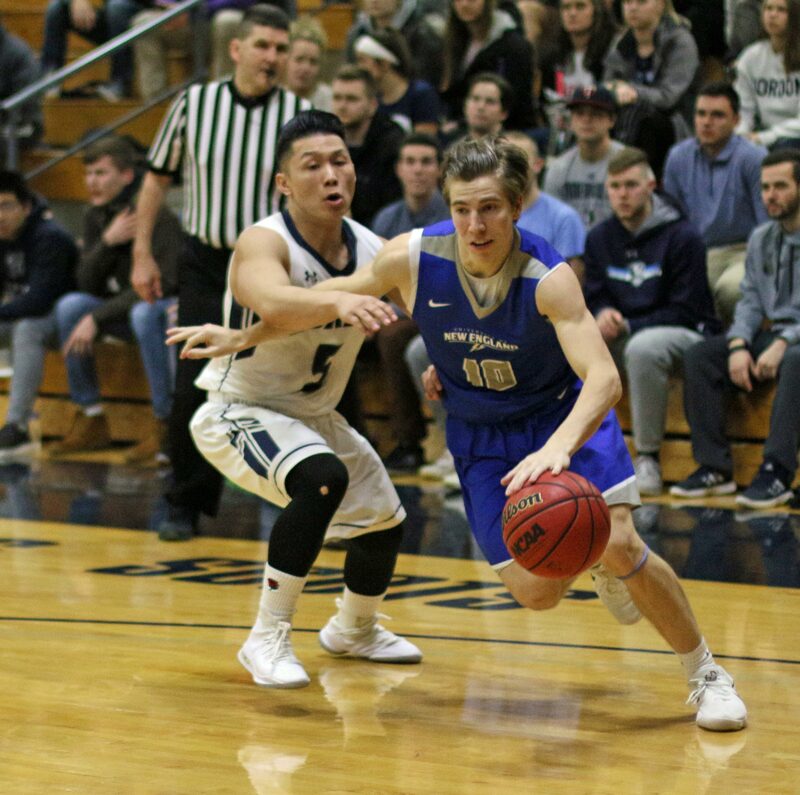 Could UNE cut into the 4-point lead? They had two shots at it and missed both tries. 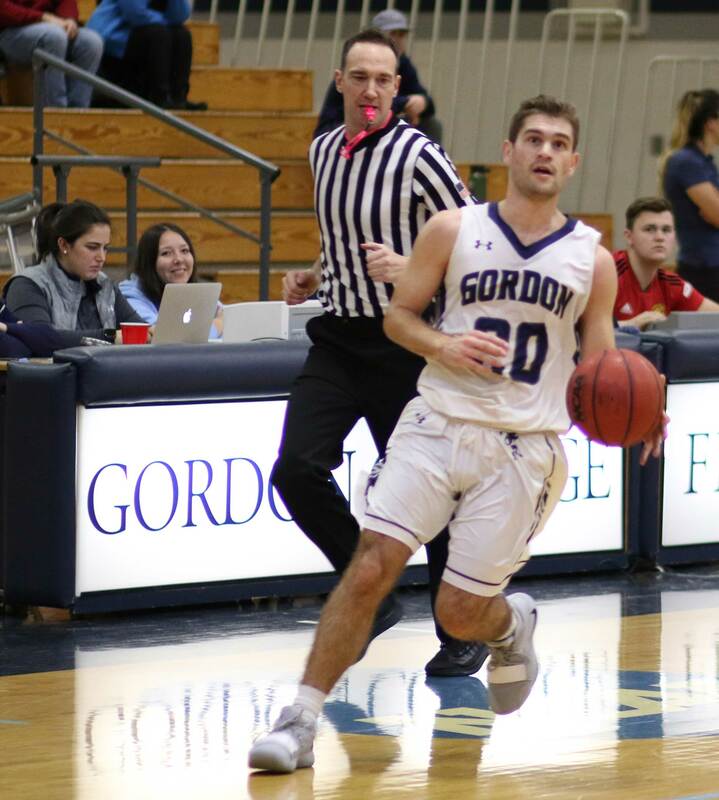 UNE was forced to foul after each missed attempt to stop the clock and see if Gordon could make pressure free throws. 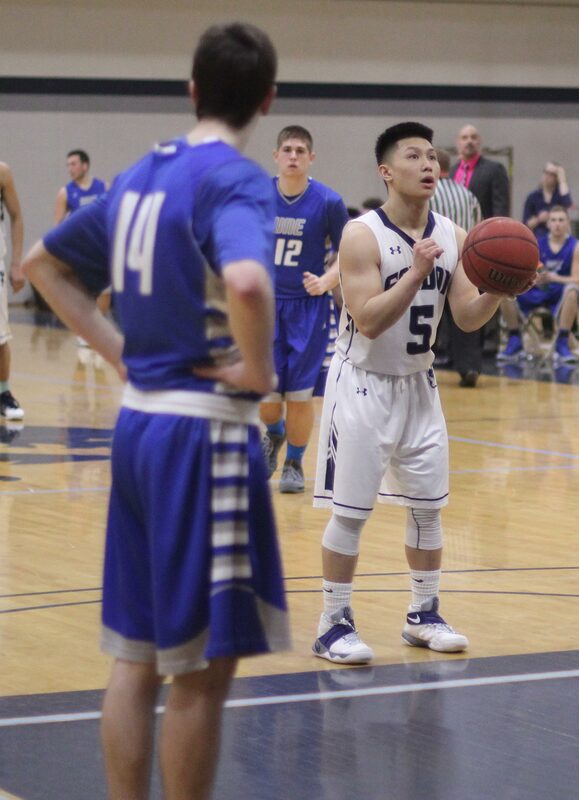 Unfortunately for UNE, the Scots kept the ball in the hands of Jaren Yang the Commonwealth Coast Conference’s best foul shooter. 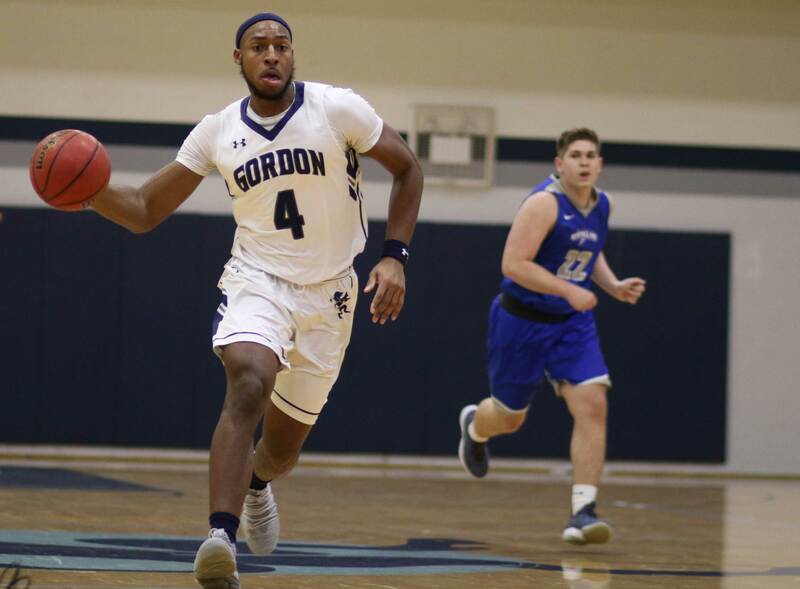 He calmly went six-for-six in the final minute and those points offset a Jean-Luc Parker layup and Gordon had its 14th win. 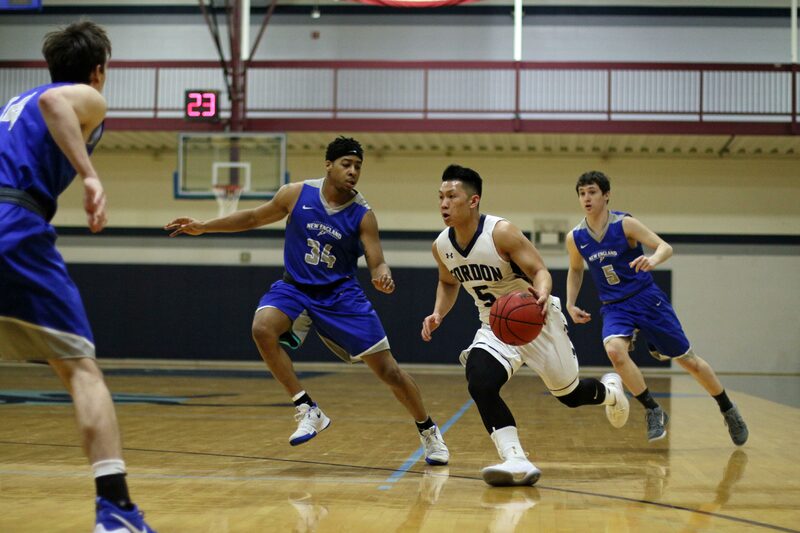 UNE played some zone defense as well as man-to-man. It looked as if the Scots were a bit slow in figuring out how to attach the defense they faced. In the first half, they were much better at it. 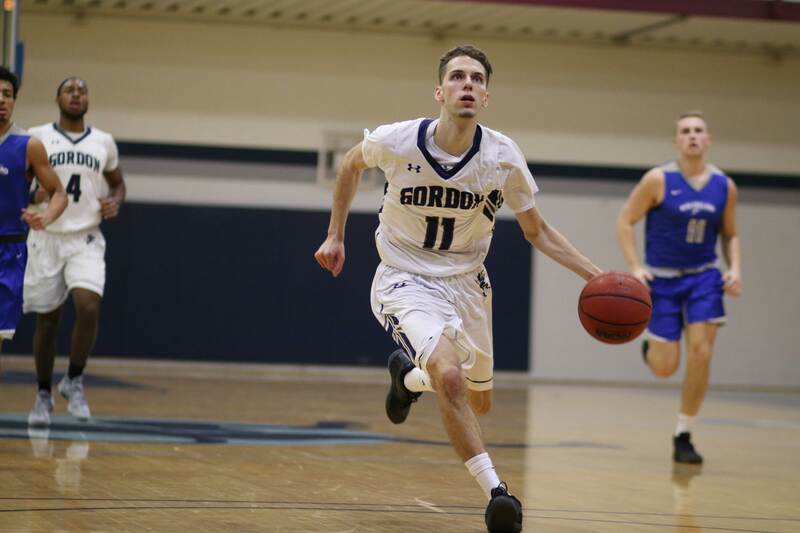 Sam Traicoff came off the bench to give Gordon eight points (career high for the freshman). 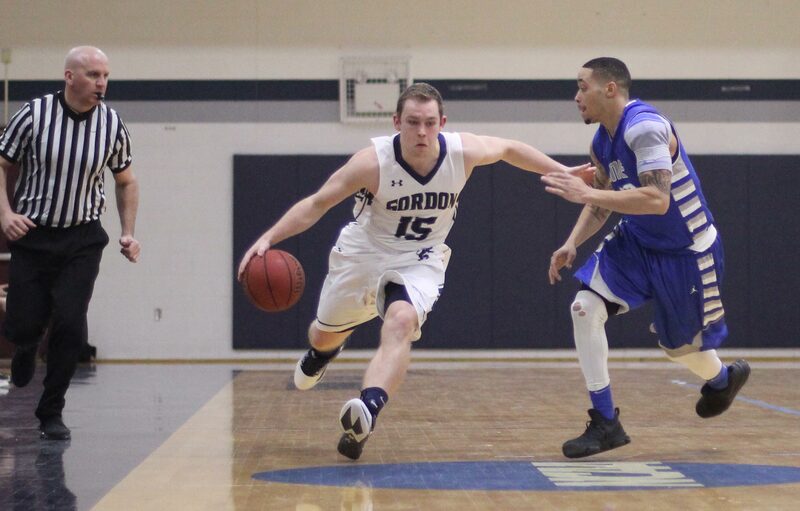 Sam Johnson had his 14th double/double (12 points, 10 rebounds) of the season. 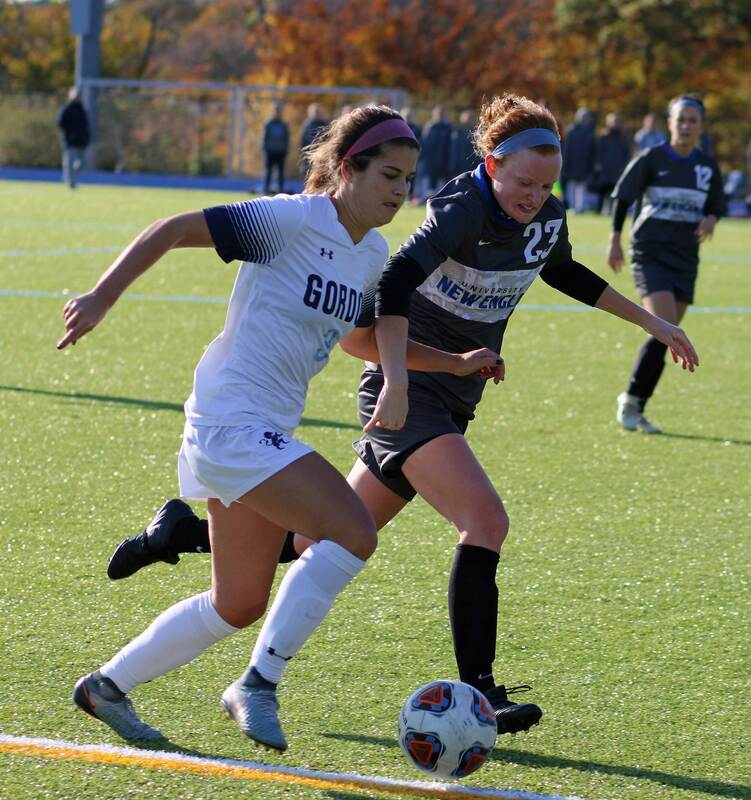 The Scots will be finishing the regular season on Saturday in Newport (RI) versus Salve Regina. 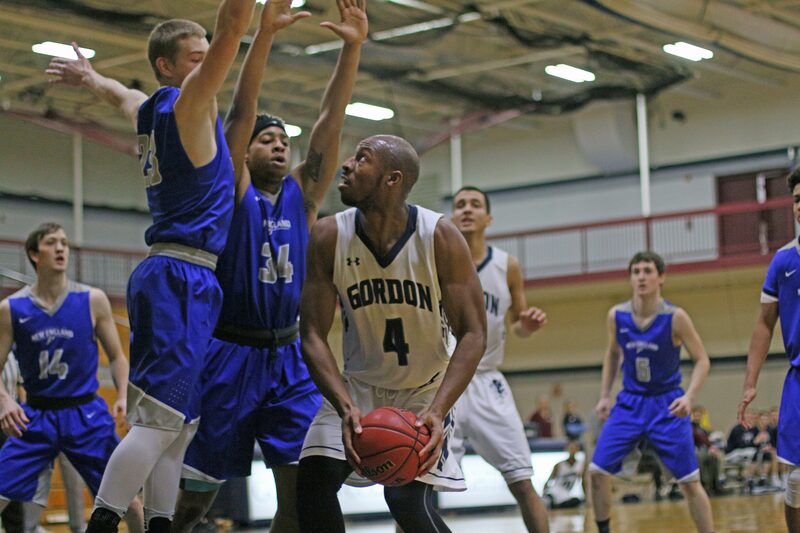 If things go as they appear, Gordon will be back at the Bennett Center next Tuesday hosting Wentworth. 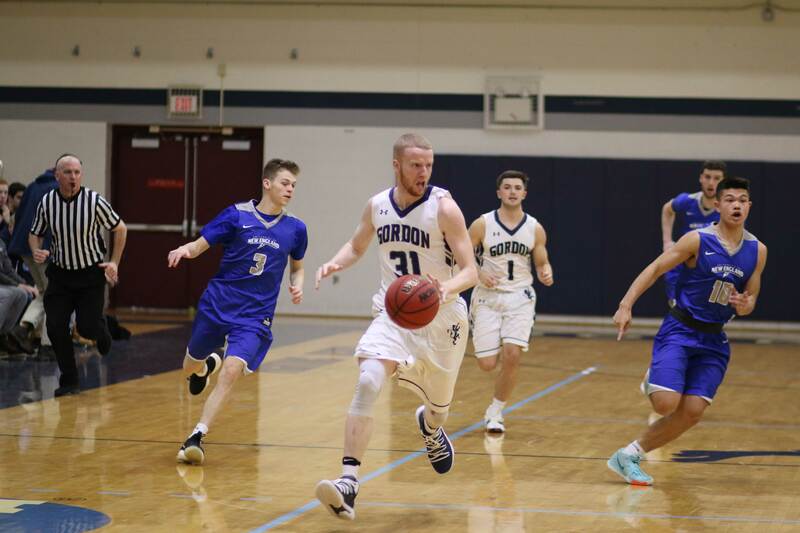 (Amesbury MA) The Scots squandered a big first-half league but came on strong in the final seven minutes of the game to defeat The University of New England, 74-62, on Wednesday night in Biddeford (ME). Long-range shooting was important for both teams. 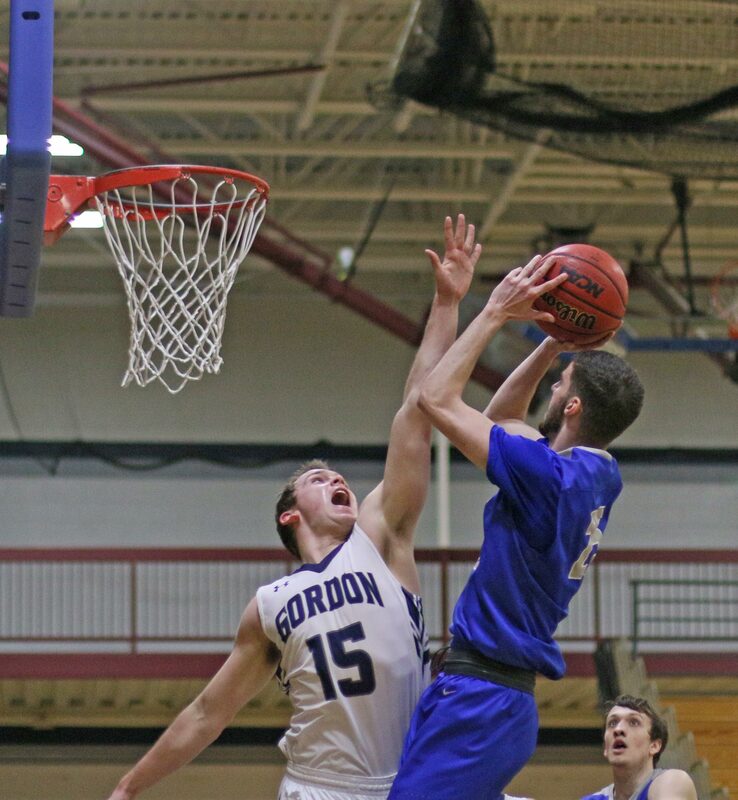 Jake Haar (13 pts in the first half) helped Gordon (8-6) to a lead as big as sixteen (36-20) in the first half. 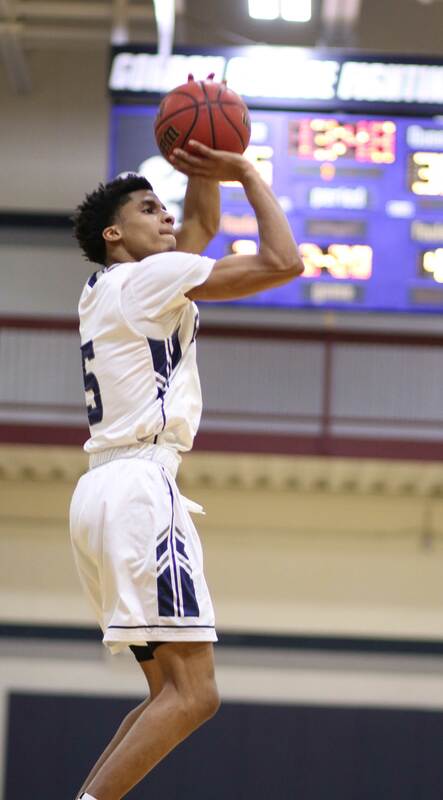 In the second half, it was CJ Autry’s turn to light up from long-distance. 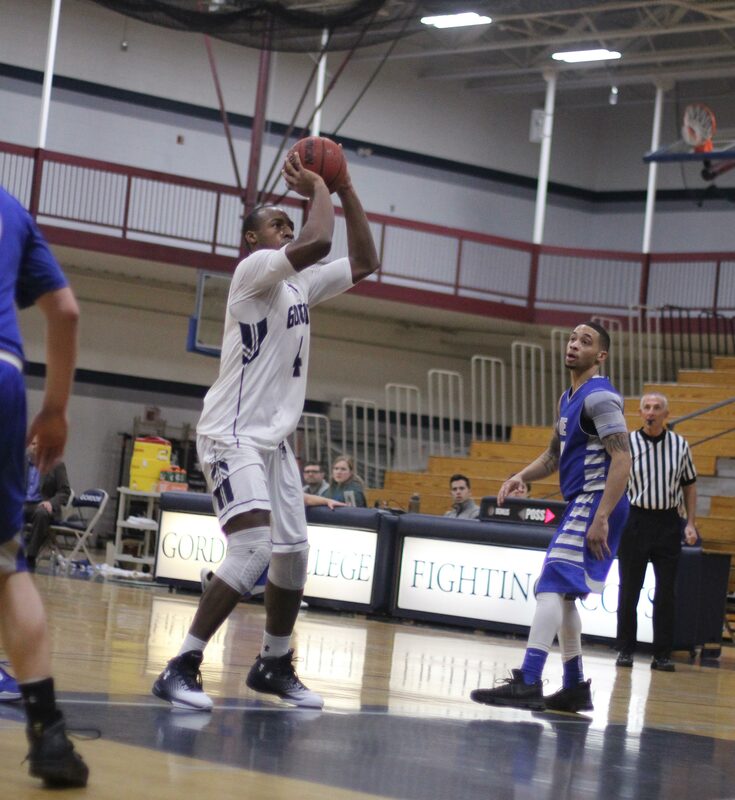 CJ’s five triples were part of UNE rally that had the Nor’Easters ahead, 45-44, with 12 minutes left. This was now anyone’s game. Could somebody cool off CJ Autry? Could Gordon find some consistent offense? Junior Jake Hart applied the glue to CJ and the clean looks vanished. 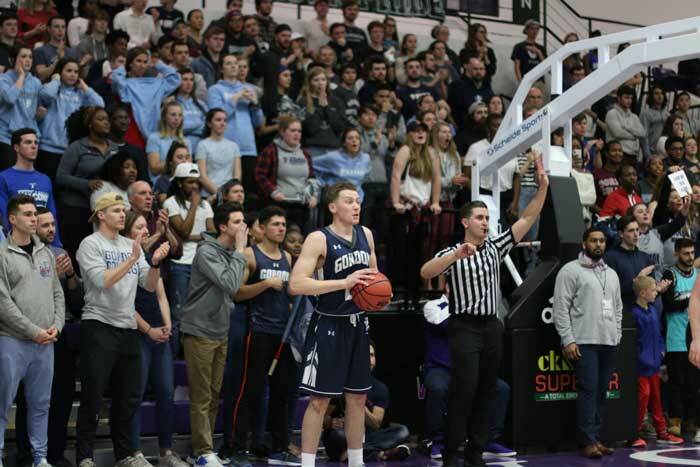 The UNE shooting (bottom in the CCC in field-goal percentage) went south and it was costly for the home team. 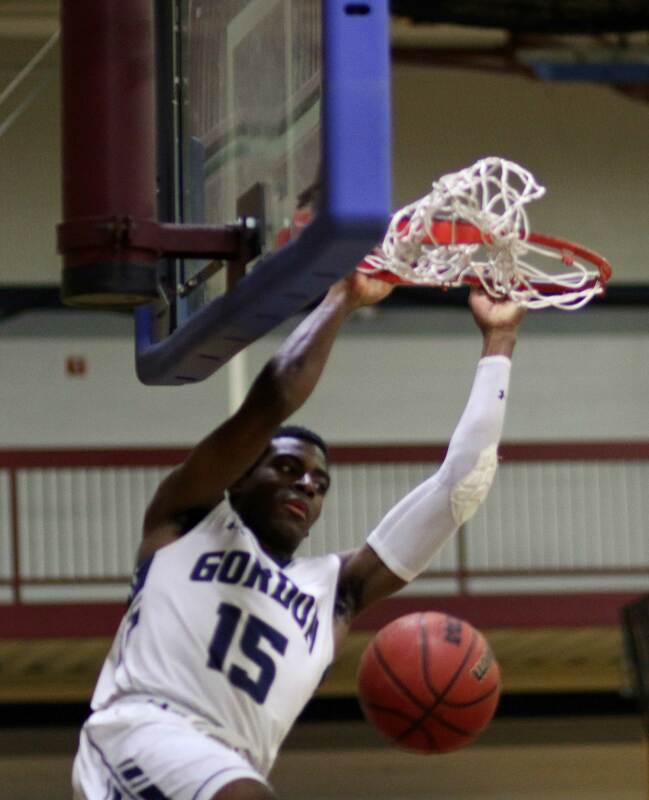 At 7:12 GC had a 54-53 lead. 3 ½ minutes later the lead was 63-53. UNE never recovered. 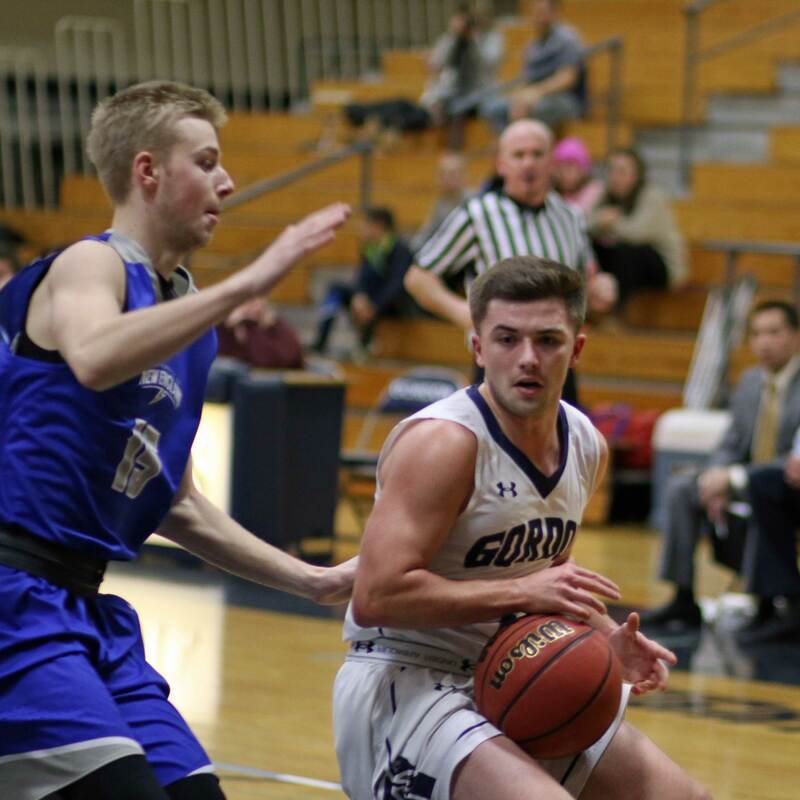 Where did the late-game offense come from for GC? Close to the basket and the foul line. 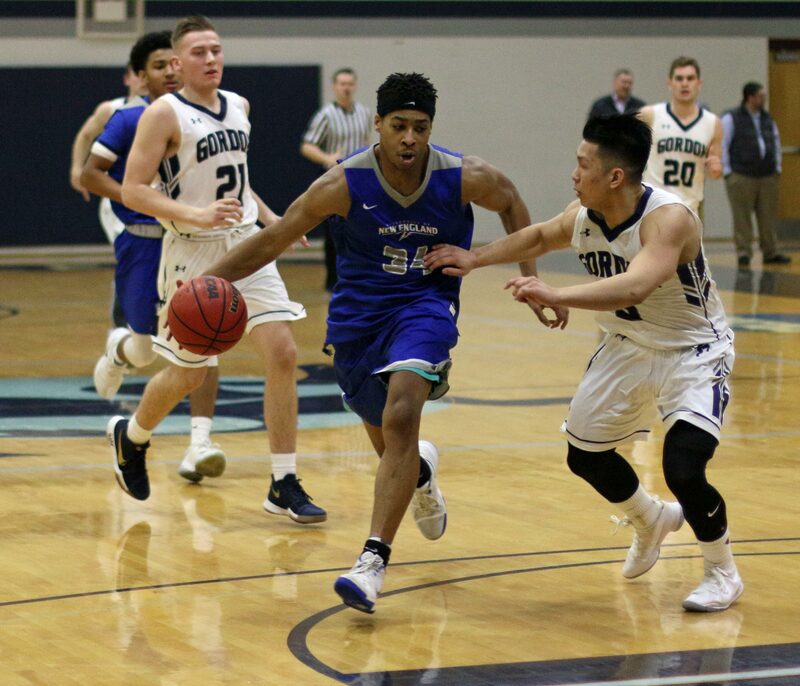 For a while it was Garrisson Duvivier (14 second-half points) and then it was Sam Johnson (11 second-half points including 7-of-8 from the free throw line). What interested me in the late-game breakaway was that Garrisson and Sam were not in the game together. 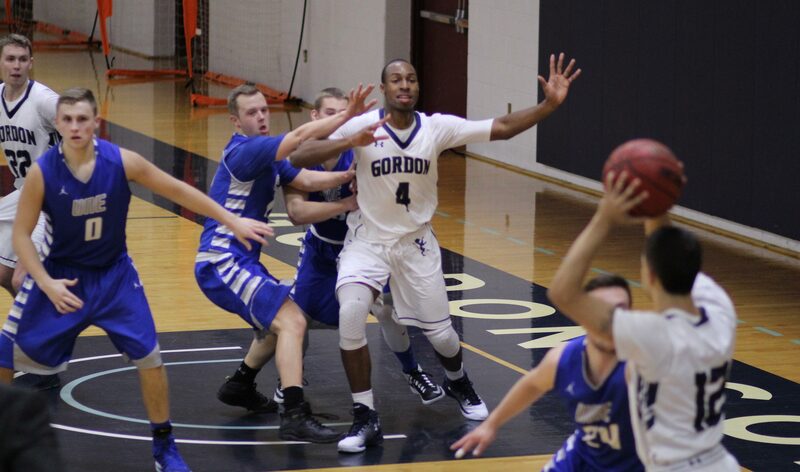 The strategy worked because with four shooters in the game with Garrisson or Sam, UNE’s help defense was limited. Give Garrisson or Sam one-on-one coverage without additional defenders nearby and points and/or free throws will soon follow. 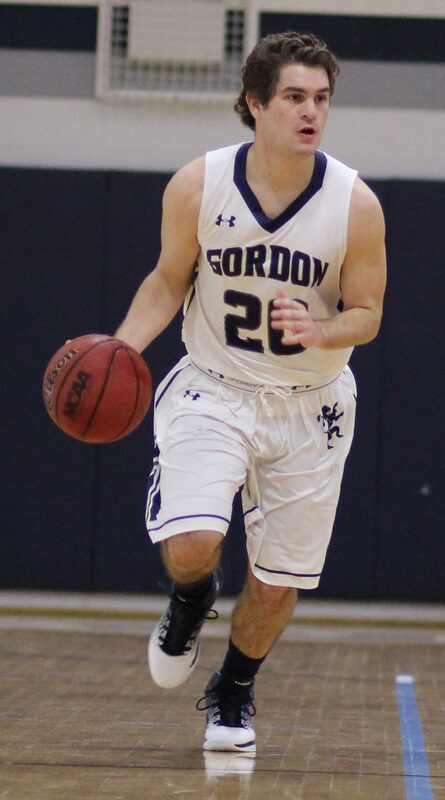 That was the way it was as GC pulled away to a double-digit lead in the closing minutes. 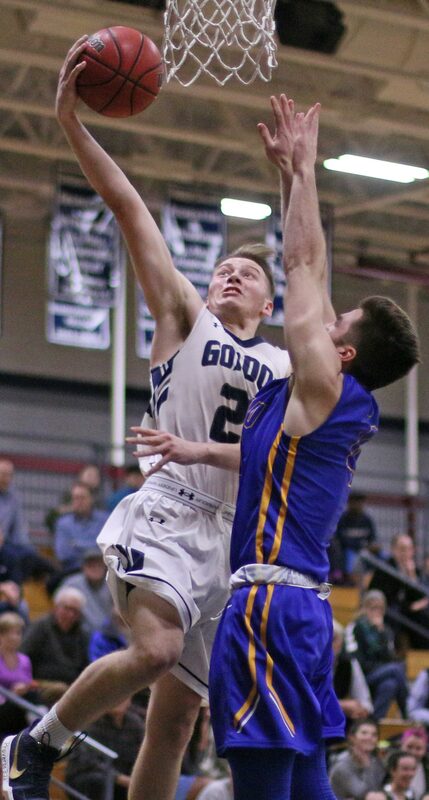 The Nor’Easters (4-10) started the game in a zone and I could only think of two words: “Jake Haar.” Sure enough; bang, bang, and bang and Jake and the Scots were off to a fast start. That zone was discarded before the half was over. 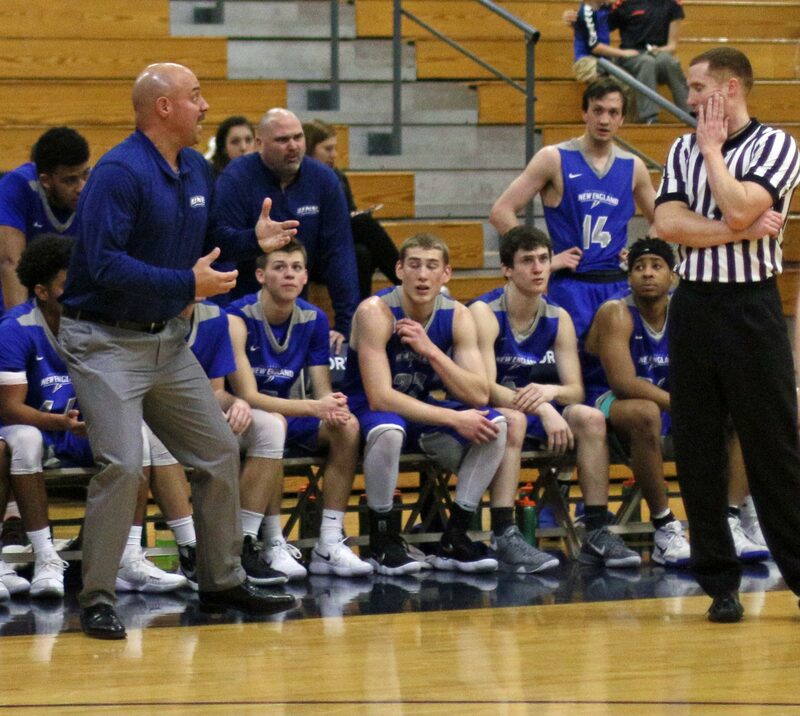 As UNE struggled to score in the first half, GC coach Tod Murphy used his bench. 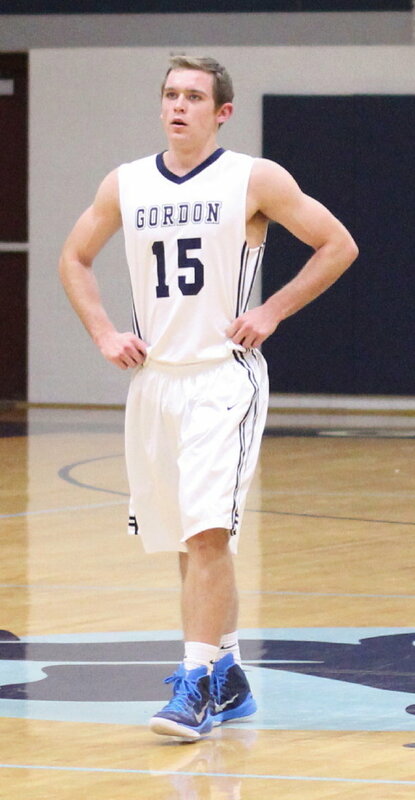 Ten different Gordon players registered points in the first half. 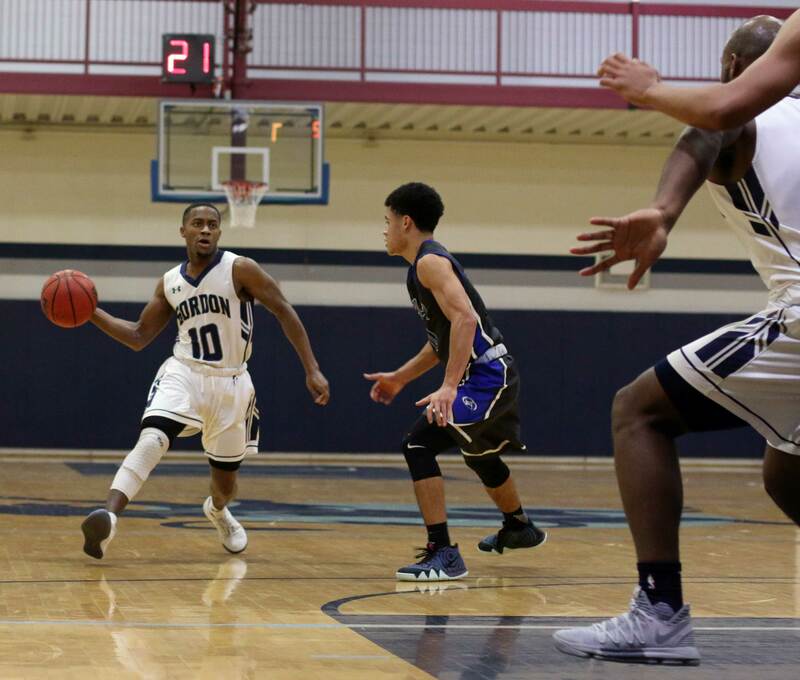 Sophomore Garrisson Duvivier reached a career-high in assists with eight. 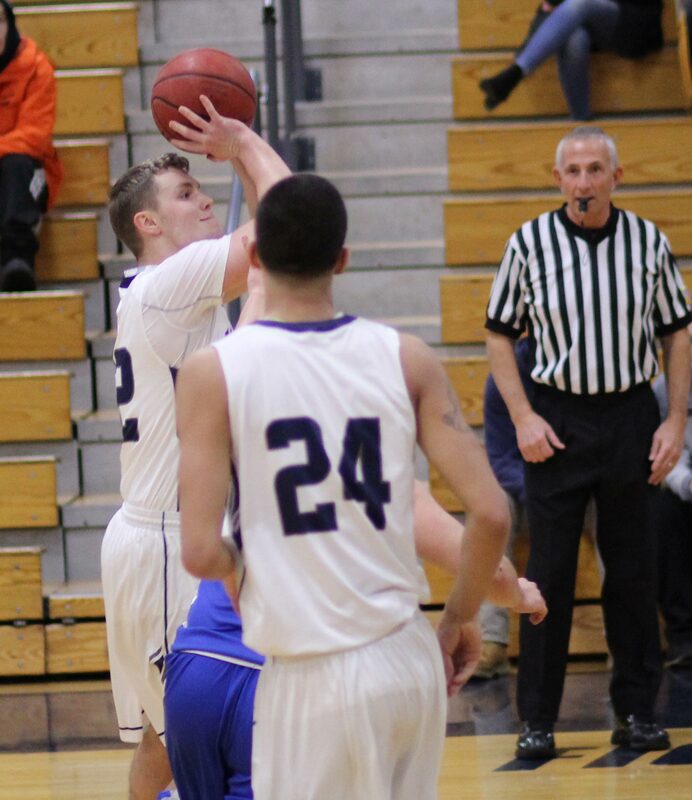 His behind-the-back pass to uncovered Jake Hart near the basket in the second half got Jake an easy layup. Sam Johnson registered his 11th double/double of the season. 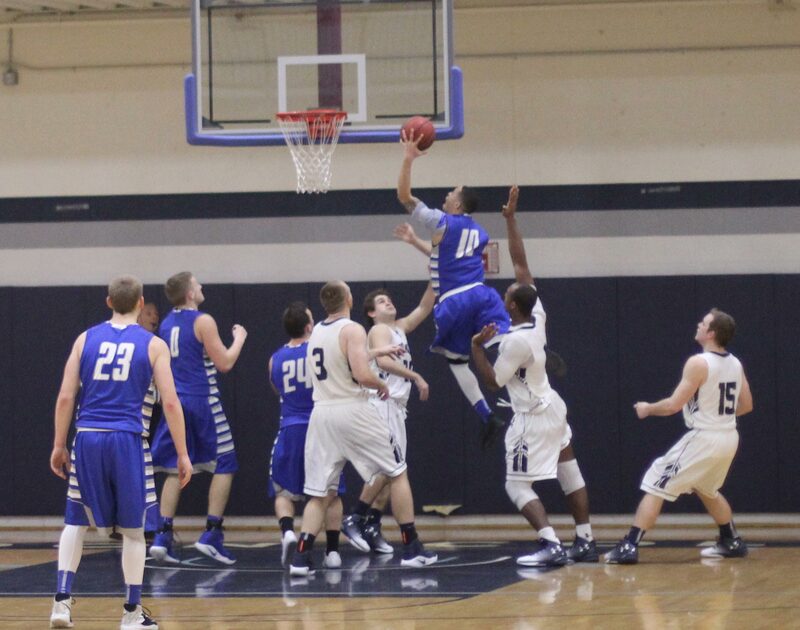 He had to deal with 6’10” defenders in this one. Good feed from UNE. The sound came on later and it turned out to be Mike Antonellis who also broadcasts the Portland Sea Dogs games. 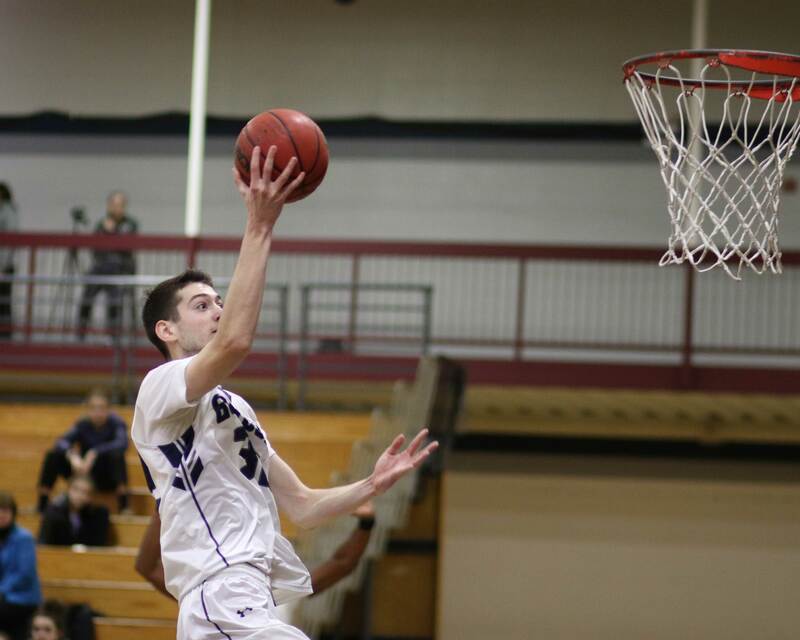 Nichols took its first CCC defeat as Eastern Nazarene got them by two points at Dudley. 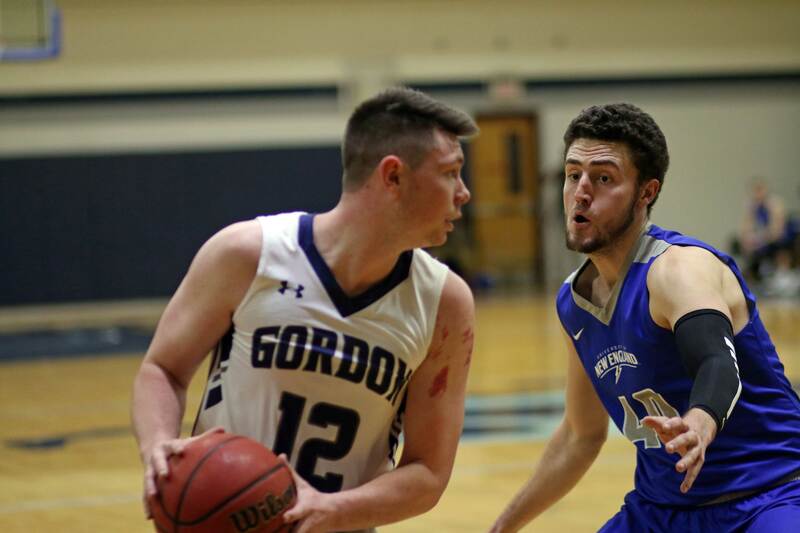 Next for Gordon is Roger Williams at the Bennett Center on Saturday (3PM). The Hawks have won eight straight.